Michael N. Jacobson is Professor of Saxophone and Associate Dean for Operations at Baylor University School of Music. He was formerly Director of Jazz Studies and Assistant Professor of Saxophone at Mansfield University in Pennsylvania from 1980-1984. He is Past President of the North American Saxophone Alliance and also acted as Region 4 Director, and Membership Director. Currently, he is the Texas Coordinator for the NAWPI. He holds degrees from Arizona State University (BM), Indiana University (MM), and the University of Texas at Austin (DMA). IU also awarded him their prestigious Performer’s Certificate. His recording of John Harbison’s San Antonio, issued in 1999 on the AUR label, was a first round Grammy Award nominee in the category “Best Instrumental Solo Performance without Orchestra." He also has recordings on Equilibrium, AUR, RonCorp, and his Mixed Company CD is available on iTunes. 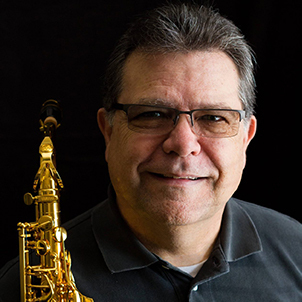 He is an active Artist/Clinician for the Yamaha Corporation, D’Addario Rico Reeds, and a former clinician for the MakeMusic Corporation with both Finale and SmartMusic software. He has published in the Saxophone Symposium, Saxophone Journal, and also authored a Music Technology column in Jazz Player magazine.